At Homes for Hope, our builders help hundreds of entrepreneurs around the world start and grow small businesses by building homes and donating the profit to support HOPE International. Our mission, building locally to fight poverty globally, is brought to life by the overflowing generosity of people with not only great talent and means, but also conviction. 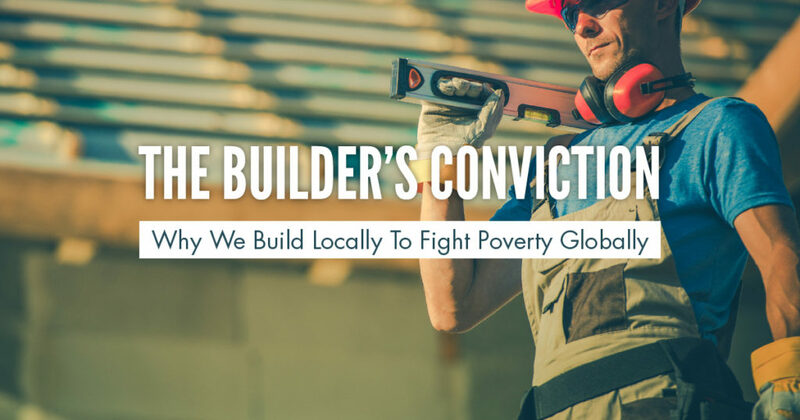 This “builder’s conviction” is rooted in the belief that we have been created in the image of God. God gave humankind a finite piece of His endless creativity and power to change the world we live in. Through this gift, we received the ability to survive, work, live, and even build homes. The second part of the “builder’s conviction” is the belief that we are children of God. As His children, we have an innate desire to please our dad, get His attention, and make Him proud! Our builders know that God loves caring for the poor, so they seek to please Him by giving away earthly treasures, so underserved families can be empowered to provide for themselves. As we contemplate the “builder’s conviction,” we’d like to share this video from WAY nation where they discuss what it means to say and believe “I am made in the image of God.” We hope that you enjoy it. If God reveals anything to you while watching this video, we would love to hear from you! Please send any notes, takeaways, or ideas to Jack Nulty at jnulty@homes4hope.org.